When brass sheet is etched a burr stands proud on the edge of the etch (excuse the pun). It is good modelling practise to remove these etching burrs. 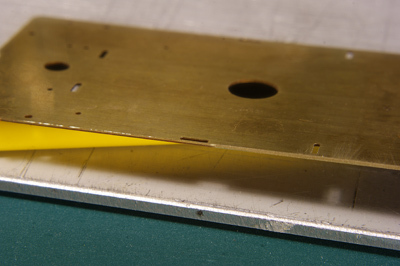 The visible edges become nicely smooth and the invisible edges form better bonds when soldered. So, first thing was to clean up the edges of many parts. Warning: don't clean up the etch burrs on the vertical sides of the cab. They are purposely etched in a certain way to form a 45 degree angle so that the gap between two right-angled sides closes completely. First, two nuts are soldered. The nuts will later hold the drive mechanism. I used 240 degree solder to prevent them coming loose during other solder jobs. The cab tack soldered. The cab sides fall into place by tabs and slots. 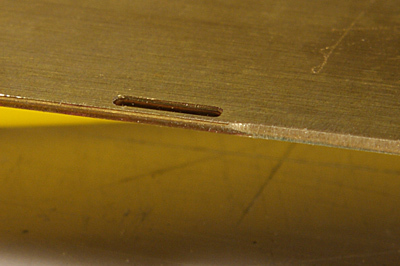 Once satisfied with the alignment of all parts I ran fillets of solder along the seams. After taking a look two, three times I concluded that the etch to hold the drive really needed to be folded "the wrong way", that is with etched folding seams on the outside. All seams were strengthened with a fillet of solder. The bottom plate of the Tenshodo SPUD didn't fit in right away. After some scraping (by half a mm on both sides) it did. As said I will fit in a better drive in due time but for now I'll use the one that is provided. But I must say I find it very disappointing to find a drive like this in this quality kit. On the other hand: the kit dates from 1982. What else was there on the market at the time?